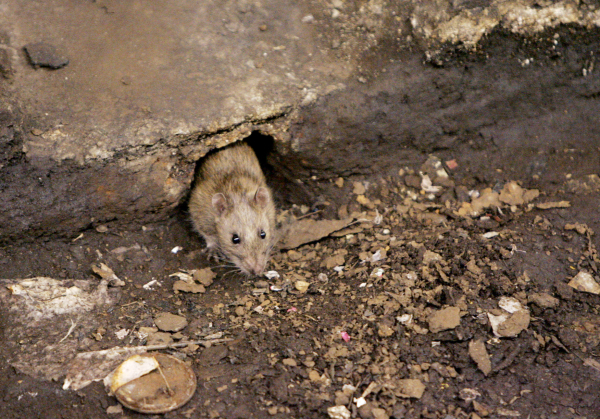 By Katie Akin on Monday, July 16th, 2018 at 4:00 p.m.
A rat comes briefly out of its hole at a subway stop in the Brooklyn borough of New York, before retreating at the arrival of the F train. Fortunately for everyone in New York City, a story about giant rats eating humans is a hoax. A story on sciencearticle.website said four homeless men were eaten alive, a gruesome narrative accompanied by photos of large rats held by sanitation workers and lying on a table. The warnings of 40-pound rats gnawing on unconscious humans isn’t true. When we asked the city about it, a health department spokeswoman Carolina Rodriguez said, "The only giant mutant rat in New York City is Master Splinter, and we all know he is partial to pizza just like another famous New York City rat." She explained that most rats in the city are Norway rats, which grow between 12 to 18 inches, with 5- to 6-inch tails. At most, they weigh about a pound. According to Rodriguez, the health department has not received any reports of rat attacks. This article also includes three pictures, all of which are gross. The first picture shows seven huge rats, laying dead on a table. When reverse-image searched, this photograph can be traced back to a National Geographic photo gallery on giant swamp rats. Also known as nutrias, these rodents weigh about 17 pounds and have been introduced to coastal regions in the United States. In Louisiana, they’ve become so prevalent that the government will pay hunters $5 per kill in an attempt to prevent overgrazing. These rodents do not live in New York, and they are unlikely to ever make the move. A 2014 study shows that nutrias prefer warmer climates, where only a few days per year are lower than 24 degrees Fahrenheit. New York’s sewer systems certainly don’t fit the bill. The image is reposted a second time within the article, although this time altered to make it appear that it was broadcast on the news. A breaking news runner gives the image an authentic look, but the fake "5 NEWS" logo and the "smhwtfnews.com" link make it clear that the screenshot was fabricated. The third image, in which a man in a green shirt appears to be holding a giant rat, is an old internet hoax. Reverse-image searches reveal that the man is demonstrating forced perspective: the rat isn’t bigger, it’s just closer to the camera. An accompanying image, which was omitted from the giant rat article, shows the same man and the same rat, but in the proper perspective. Both the giant swamp rat and the forced perspective images have been shared widely across fake news sites to "prove" that giant rats were caught in London, Hong Kong, and other urban areas across the world. This article alleges that four men have died after being eaten by giant-sized rats. However, the story is completely fictional. There are no mutant, man-eating rats in New York, and the pictures have been stolen from various other giant rat hoaxes over the years. Published: Monday, July 16th, 2018 at 4:00 p.m.